Richard Gowen, IEEE President, 1984, directed the joint NASA-Air Force space medical instrumentation program, and he supervised the design of medical experiments in the Apollo and Skylab space programs. Richard Gowen was born in New Brunswick, New Jersey. He received B.S. degree in electrical engineering from Rutgers University in 1957, where he also served in the ROTC. He then began work at the RCA Research Laboratories, but was called to active duty with the Air Force. While in the Air Force, he began graduate study at Iowa State University. He earned his M.S. in electrical engineering in 1959 and his Ph.D. in 1962. Dr. Gowen then joined the faculty of the Air Force Academy. While at the Air Force Academy, he directed the joint NASA-Air Force space medical instrumentation program and led the design of medical experiments in the Apollo and Skylab space programs. He was also a member of the NASA astronaut medical launch recovery team for six capsule space flights. Additionally, he served as a government consultant for the Department of Defense. He retired from the Academy in 1977 as a professor of electrical engineering with the rank of lieutenant colonel. Dr. Gowen continued his work in education as Vice President and Dean of Engineering at the South Dakota School of Mines and Technology. After seven years there, he moved to Dakota State College as President. In 1987, he then returned to South Dakota School of Mines and Technology as president of that institution. The school’s profile was raised under his leadership. Gowen guided the development of new engineering programs and an expansion of graduate research, including projects served the needs of NASA and the military. SDSMT’s ROTC also flourished under Dr. Gowen’s tenure. Gowen actively promoted Native American involvement in the sciences and worked to improve South Dakota’s retention of state-educated individuals. 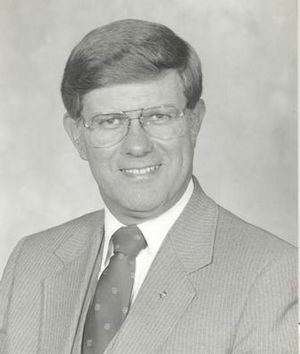 Gowen retired from SDSMT in 2003. Afterward he was appointed to the South Dakota Board of Education. He has coordinated the conversion of the Homestake Gold Mine into a National Science Foundation supported National Underground Science Laboratory. He is presently the President and CEO, of Dakota Power, which is developing lightweight electric drive systems for military and civilian use. In 1984 Gowen was elected as president of the IEEE. He also served as president of the American Association of Engineering Societies in 1986. He was named as an Eminent Member of Eta Kappa Nu in 2002. This page was last edited on 27 July 2018, at 00:10.